LIMERICK's two remaining sides in the FAI Junior Cup have learned of their opposition for the last 16 draw. Aisling Annacotty, fresh from their last 32 win over Newport, have been draw away to Ballymun Utd. Limerick's other side still in the hunt for the famous trophy, Regional, play their round of 32 tie this Sunday at 2.15pm against St Pauls of Artane. 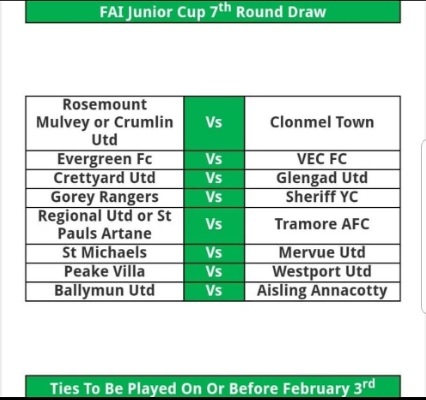 Should Regional come through that tie, they would be at home again, this time to Tramore AFC of Waterford. The last 16 ties are to be played on or before the weekend of February 3.